January 2003 marks the beginning of the year-long celebration of the Bicentennial of the Louisiana Purchase. Next month NOPL's contribution to the celebration, an exhibit titled "A Great and Growing City": New Orleans in the Era of the Louisiana Purchase, will open in the Louisiana Division of the Main Library (and here in NUTRIAS). 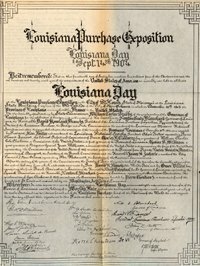 Meanwhile, we kick off the festivities by presenting several images showing Louisiana's participation in the Louisiana Purchase Exposition in St. Louis in 1904, the great world's fair which had as its focal point and raison d'être the celebration of the Centennial of the Purchase. 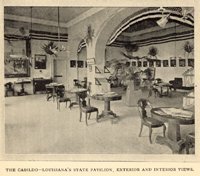 The images are taken from two sources contemporary to the St. Louis fair: Louisiana at Louisiana Purchase Exposition: Report of the Louisiana Board of Commissioners to the Louisiana Purchase Exposition Held at St. Louis, Missouri, 1904, published in New Orleans circa 1905; and Louisiana and the Fair: An Exposition of the World and Its People and Their Achievements, edited by J.W. Buel and published in ten volumes in St. Louis in 1905. Click on the images to see a larger version of each image.